For 50 years FLEISCHER has been manufacturing high-quality furniture that focuses totally on the user. 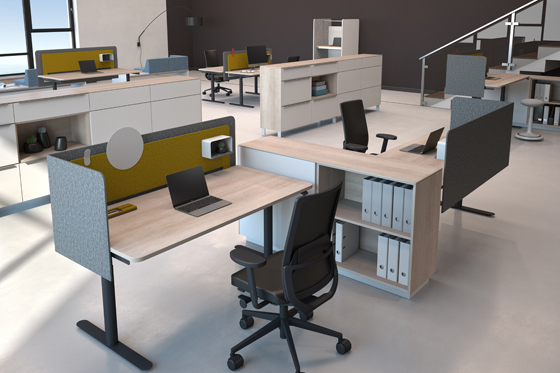 With its new additional FRAME line for workstations, the German manufacturer is facilitating concentrated work at a flexible and easily customisable workstation. At this year’s Orgatec, Fleischer will introduce FRAME. 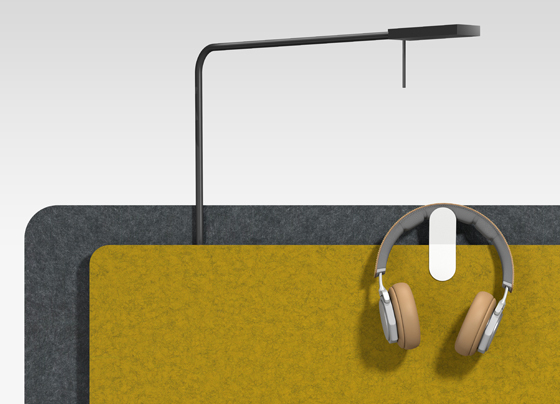 This new workplace accessories line is decidedly friendly in appearance and functionally adapted to the demands of the modern work world, right down to the smallest detail. The catchwords here are ‘desk sharing’ and ‘open plan’ – signifying, more or less, the dissolution of the fixed individual workstation in favour of a flexible mode of working. The benefit for the employer lies in the saving of space and, therefore, of costs. For the employee, the advantage lies in the free choice of where to work, in accordance with his or her inclination and assignment. There are also criticisms of this new way of working. Oft-mentioned complaints are the loss of one’s ‘own’ workstation and the resulting diminished connection with the work environment, as well as the daily need to set up one’s workstation. Compared with separate individual offices, open-plan work spaces can also pose a greater challenge to concentration. What is ultimately decisive for the success of the open concept, then, is how it is implemented. The furnishings and overall design of the space must facilitate, on the one hand, the desired interconnection and communication and, on the other, focused work at a quickly personalisable workstation. Fleischer, the Bochum-based office furniture specialist, has taken on this task. Located in the middle of the Ruhr industrial region, where coal, steel and iron once reigned, and where structural change brought an upheaval in patterns of dwelling, working, leisure and culture with a suddenness hardly seen elsewhere in Western Europe, Fleischer is developing employee-friendly office concepts. In this lively environment, the company has been working on office design solutions for six decades, creating places in which things are set in motion. In 1958, during Germany’s ‘economic miracle’, Willy Fleischer designed a height adjustment mechanism for furniture that launched the firm on its successful trajectory. From this starting point, the Fleischer company evolved over the decades into a manufacturer of a full range of office furniture. 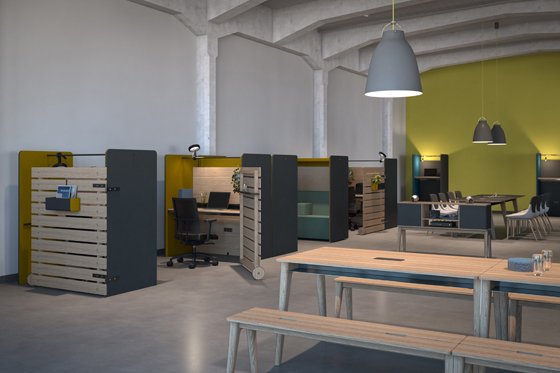 The medium-sized company, now under second- and third-generation family management, develops and produces high-quality modular furniture and individual solutions for the work environment – all made in Germany. 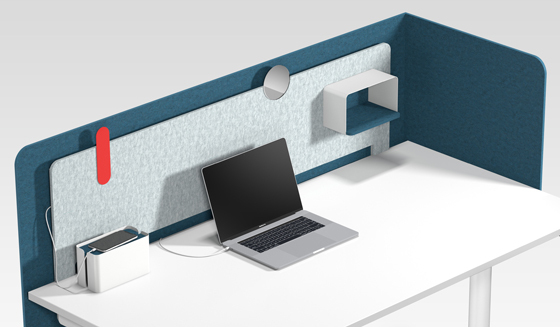 For both fixed and, above all, non-territorial workstations, Fleischer has now developed the FRAME line of accessories. The basis of FRAME is a double screen that is attached to the back side of the desk. The two layers of Neotex provide visual privacy as well as enhanced room acoustics, and allow a range of different colour combinations. 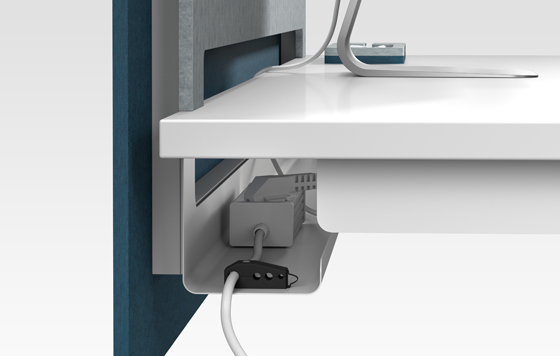 What sets the product line apart, however, is the intelligent frame to which the Neotex layers are mounted, featuring a USB connection on each side and accommodating an optional desk lamp. A further highlight is the narrow cut-out in the inside Neotex panel, along the back edge of the desktop. It provides convenient access for running cables from the desktop into the cable duct, making desktop cut-outs unnecessary. 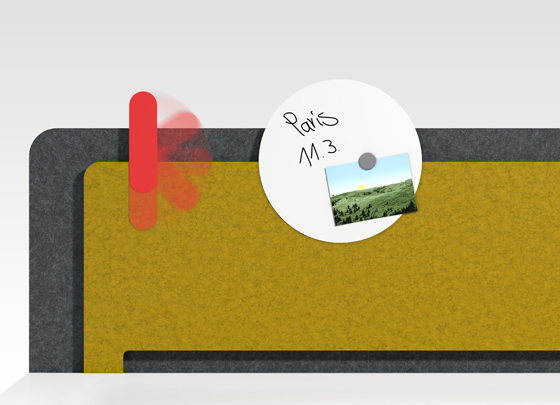 Space on the desktop is effectively maximised by the small shelf attached to the frame. The shelf can be complemented by a lockable drawer for securing valuable objects such as wallet and keys. 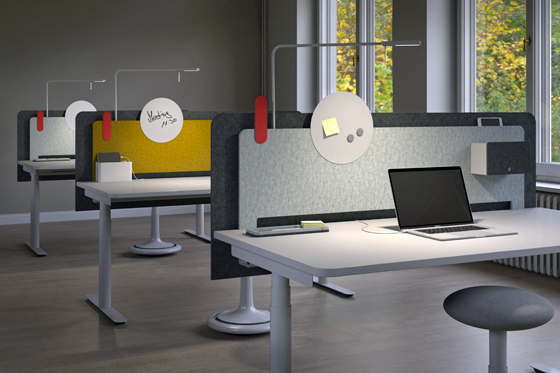 The product line additionally features four accessory elements which can be attached to the upper edge of the front Neotex panel: a mirror that affords aisle workstations an easy rear view; a headphone hook; a writable magnetic memoboard; and a red privacy signal that lets the user indicate to colleagues that he or she is concentrating and wishes not to be disturbed. 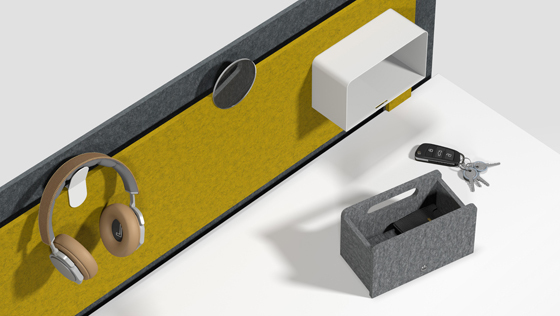 An especially practical element is the small management box, which not only offers space for pens and small utensils but also serves as a holder for smartphones and tablets. Charging cables and mains adapters simply disappear under the cable cover. The integrated power and USB sockets guarantee uncomplicated connections for all devices and quick workstation set-up. In the words of Katharina Fleischer, granddaughter of the company founder and now marketing director: ‘What’s important is that the employees feel comfortable – because when you feel comfortable, you work more productively and creatively.’ After all, working can be a pleasure… at least with the right furniture.